Kdol Leu (AsiaNews) – Modernity has brought rapid and profound changes to Cambodian society such as urbanisation, new forms of communication and new family relations. Fascinated, and yet frightened, young people want to play a leading role in society. Through her work in the field of education, the Church accompanies them and tries to protect them from the dangers of this "new world", where meeting and exchange are increasingly difficult. 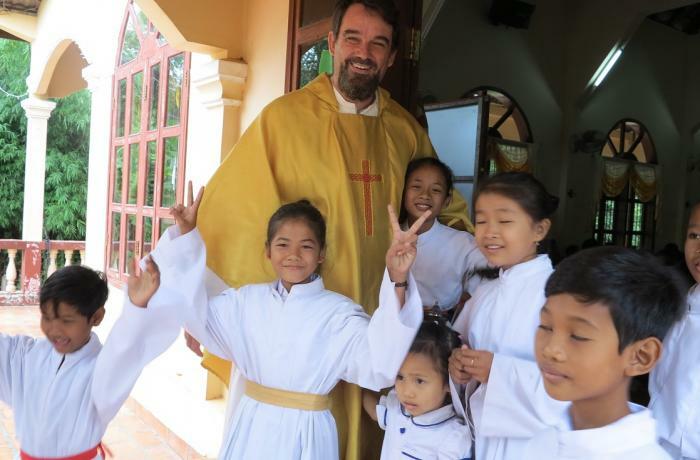 In his address at the 2018 AsiaNews Symposium, Fr Luca Bolelli, a PIME missionary who has been in the Asian country for 11 years, talked about the young Catholics who are preparing to face the future, strong because of the presence of Jesus and inspired by a deep spirit of collaboration. I am Fr Luca, a missionary with the Pontifical Institute for Foreign Missions (PIME). I have been in Cambodia for 11 years. 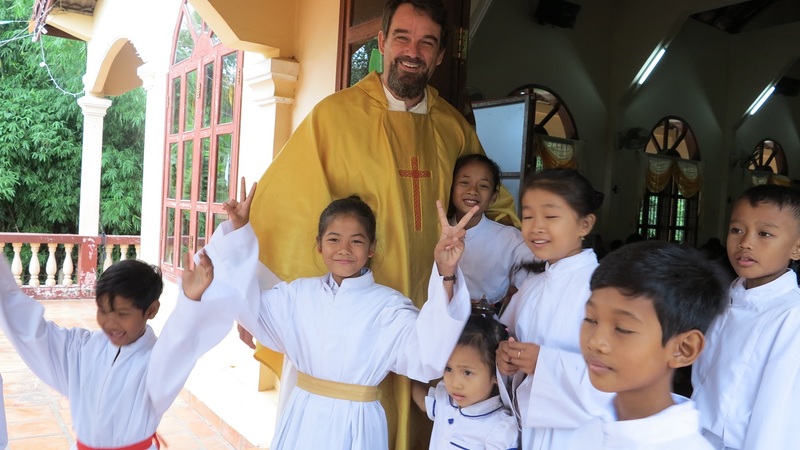 For the past nine, I have been the parish priest in the village of Kdol Leu. Right now, I am at the entrance of the church with some young people from the parish who have come to pray with me this morning. Cambodia is a very young country. According to some statistics, the average age is just 22 years. This is due to the fact that the nation went through a long period of war, which decimated the population (seniors will certainly remember the name of Pol Pot). In the 1990s there was a baby boom, which led to a large number of young people. People who come from Italy are struck by the number of children in the villages but also in the church, which is unusual nowadays among Italians. Some might compare Cambodia to the Italy of the 1960s that went through a period of reconstruction after the war and therefore saw a strong rise in the number of births. Cambodia is at a critical juncture. In the past few years, it has been moving into the modern world from a predominantly rural society that existed for thousands of years. This has had a great impact on the people, especially the young. A few days ago, a woman told me she had lived like her mother, who had lived like her grandmother, and so on for generations. Her daughter's way of life, on the other hand, is completely different. A truly epochal change is underway, creating fears but also raising expectations. Speaking on behalf of the young people you see next to me, whom I asked to talk to me, I will try to give them a voice. For them, especially those who grew up in the countryside, entering modernity means entering a new world. On the one hand, the novelty fascinates them because it leads them to new relationships and knowledge; on the other, it frightens them. The possibility of using the new means of communication like mobile phones and social media, which have taken everyone’s life like a storm, puts the world in their hands. This was not possible before. Imagine that when I arrived in this village, just nine years ago, I was the only one with a mobile phone. Now, I am the one with the cheapest model. All the kids, even those from poor families, have a smartphone that, at a low cost, puts them in touch with the world. As you can imagine, all this attracts them and involves them a lot. At the same time, however, it frightens them because they already see the consequences. For example, at school they see friends completely caught up in these media, wasting time and at risk of getting into dangerous situations. Like in many other parts of the world, this is happening in Cambodia as well. The problem is that here the kids lack a past, perhaps the 'antibodies' or the ability that would allow them to enter modernity as players. This is what we missionaries and the Church in Cambodia are trying to do. The Cambodian Church is very much involved in the education of young people through schools, linked to Salesians or some parish and missionary group, youth centres for students going to government schools and then go home, youth groups that are not common in Cambodia. Young people do not have places to meet. The latter do not exist in Cambodia, not even in pagodas. At home, in the family there is little communication between parents and children. Even in schools, priority is given to content, not education. The possibility they have of getting together in youth groups in our parishes and missions is incredible and new. Young people are attracted to the idea of ​​being able to meet and talk about what they care about the most. Modernity is turning Cambodia into an urban society, especially in the capital Phnom Penh, which is becoming a megalopolis with two to three million inhabitants. Compared to a few years ago, it is completely different. When I arrived in Cambodia 11 years ago, the first skyscraper was being built; now there are skyscrapers almost everywhere. Unfortunately, villages are losing their young people, so that even the kids you see already know that their future is far from here, in the city. For some, this is a great attraction; for others it is a lot of sadness, because they would like to stay in their hometown. I know that the future of this community is uncertain because all the kids are going away. In the villages we can see a "generational gap" among those in their twenties. For them, what is happening means a big change because the family network they have in the village does not exist in the city. If here they are used to an extended family with grandparents, uncles and relatives who help each other, in the city they are alone. The number of children is also changing. These kids have a lot of siblings but they are likely to have smaller families in the future. Cambodia is a country where 93 per cent of the population is Buddhist. Being a Christian here is not easy. Kids often say that showing their religious affiliation, at school or in other public places, is risky because it exposes them to criticism and scorn on the part of those who think they are betraying their Cambodian identity. However, the situation is changing. Christianity is known more than before, and it is no longer hated as it once was when it was the object of absurd rumours. Some of these kids are Christian like their parents; others have become Christian. Faith for them is the certainty of not being alone, but always in the presence and in the company of the Lord Jesus. This is a very strong aspect, which they might not be able to experience otherwise. Always having the Lord beside us and walking with him gives them a lot of strength, the light to make the choices they have to make and courage in carrying them forward. Knowing or not knowing Jesus makes a huge difference. I asked them if they have anything they’d like to tell the Pope. First, they said that they would like the Pope to come to visit us in Cambodia. So, if any of you could to talk to the Pope, please invite him. Secondly, they would like to help young people to be players in the Church. These kids are very much involved in the life of the community, helping children, including those in other villages. Someone might have noticed that they are exclusively girls. Here, as in other parts of the world, faith attracts women above all. Passing on the faith to others is another challenge we face. Thank you for your attention, keep Cambodia in your heart, because here lies the future of the Church.